I will pour out my Spirit upon all people. Your sons and daughters will prophesy, your young men will see visions, and your old men will dream dreams. 18 In those days I will pour out my Spirit upon all my servants, men and women alike, and they will prophesy. `I know the Lord is always with me. and my mouth shouts his praises! 27 For you will not leave my soul among the dead  or allow your Holy One to rot in the grave. 29 “Dear brothers, think about this! David wasn’t referring to himself when he spoke these words I have quoted, for he died and was buried, and his tomb is still here among us. 30 But he was a prophet, and he knew God had promised with an oath that one of David’s own descendants would sit on David’s throne as the Messiah. 31 David was looking into the future and predicting the Messiah’s resurrection. He was saying that the Messiah would not be left among the dead and that his body would not rot in the grave. Greek, Hades; also in 2:31. 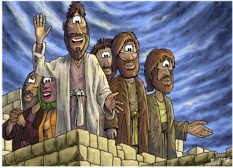 From left to right: Matthew/Levi, an un-named woman disciple (seen in previous cartoon illustrations in this series), Simon/Peter, John (the son of Zebedee) & James (the son of Zebedee). 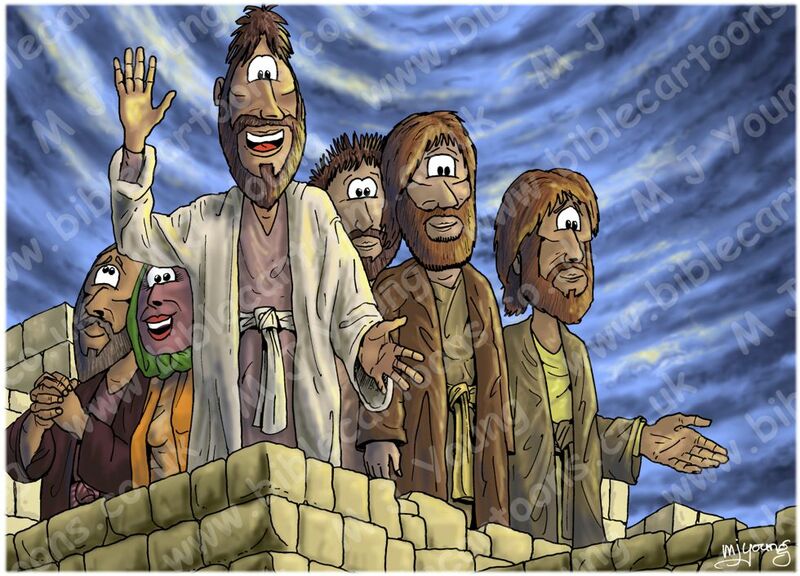 This scene is a close-up of Simon/Peter & some of the other disciples, on a rooftop. Simon/Peter was a fisherman, so public speaking was probably not a natural skill he had! But here he was inspired by the Holy Spirit & able to deliver words which we know deeply affected many people. Verse 41 tells us that about 3,000 people became Christian believers as a direct result of this speech & the wonder of hearing the apostles speaking in many different languages. Clearly the Lord God was bringing people into the newly emerging Christian church at this time.